Researchers have developed a new flexible wearable sensor designed to stick to the skin and electrochemically monitor blood alcohol content in real time through sweat. Researchers at the University of California, San Diego (UCSD), have developed a flexible, wearable sensor that can accurately measure blood alcohol levels from the user's sweat and transmit the data wirelessly to a smartphone or laptop. The sensor was designed to induce sweat levels under the patch and communicate the information received through an electronic circuit board to any mobile device through Bluetooth technology. Learn how to achieve your product development goals with sensors and data management in a special conference track at MD&M Minneapolis on September 22. Engineers aimed to develop a simple wearable that could accurately monitor alcohol consumption. Joseph Wang, a nanoengineering professor at UCSD and one of the leaders on the research, told university news that the device could be a convenient way to help people avoid dangerous road accidents that result from intoxication. "Lots of accidents on the road are caused by drunk driving," Wang said. "This technology provides an accurate, convenient, and quick way to monitor alcohol consumption to help prevent people from driving while intoxicated. The device could be integrated with a car's alcohol ignition interlock, or friends could use it to check up on each other before handing over the car keys." The device measures blood alcohol levels through what is known as insensible sweat, perspiration that occurs before it can be perceived as moisture on the skin. The downside is that insensible sweat can be up to two hours behind the actual blood alcohol reading. However, Wang and his colleagues have developed this new sensor technology to read alcohol levels in sweat that lag no more than 15 minutes behind actual blood alcohol readings. Blood alcohol levels have always been the most accurate and reliable indicator of a person's alcohol level, but developing a simple and efficient way to monitor them has presented a challenge. Finger pricking became the standard practice for measuring blood alcohol levels, but this sort of invasive technique isn't very practical when it comes to monitoring blood alcohol levels outside of a lab. Breathalyzers have become the most ubiquitous tool for estimating blood alcohol concentration, but they can still produce inaccurate results. Research has shown that alcohol levels detected in a person's breath right after taking a drink will typically read higher than their actual blood alcohol concentration, and breathalyzer results can also be obscured by drinking other substances, such as mouthwash. This isn't the first time Wang and his colleagues have explored skin patch technologies as a novel health tracking solution. Last year, Wang and his UCSD colleagues debuted a temporary tattoo sensing device that could detect blood-glucose levels with the same efficiency as the laborious finger pricking methods that so many diabetic patients have grown accustomed to. Similarly, researchers from the University of Illinois showcased earlier this week a new health tracking tattoo that can monitor sun exposure when worn on the skin. 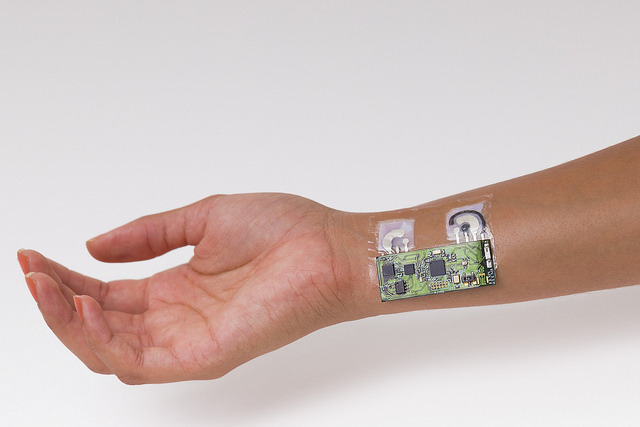 Both the glucose patch, and the health tracking tattoo were designed to push the field of medtech wearables to the next level, and Wang's latest skin patch looks to continue that trend. As the group moves forward with their research, they hope to adapt the device so that it can monitor blood alcohol levels for up to 24 hours. The device has already proven to be accurate through a variety of different stress tests that bend, twist, and shake the device, as Wang and his colleagues try to prepare the technology for life in the real world.